(Nanowerk News) The Helmholtz Institute Ulm (HIU) established by Karlsruhe Institute of Technology (KIT) is pushing research relating to batteries of the next and next-but-one generations: A research team has now developed an electrolyte that may be used for the construction of magnesium-sulfur battery cells. 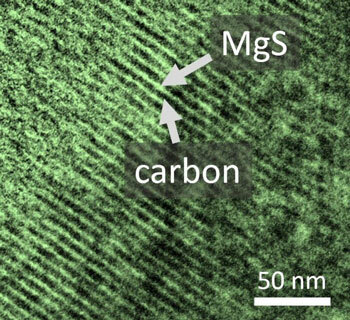 With magnesium, higher storage densities could be achieved than with lithium. Moreover, magnesium is abundant in nature, it is non-toxic, and does not degrade in air. The new electrolyte is now presented in the journal Advanced Energy Materials ("Performance Improvement of Magnesium Sulfur Batteries with Modified Non-Nucleophilic Electrolytes").